A combination of several artistic traits is inherent in creative work of Andrei Buryak, and it’s hard to distinguish which one prevails. 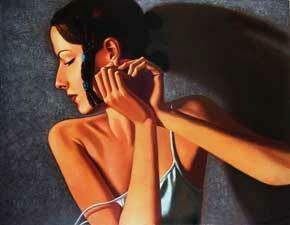 The immanent feature of his paintings is an inward readiness for expression. His works of art give free play to viewer’s imagination and are saturated with underlying messages. Naive stardust, sentimentality and meditative concentration on intriguing interconnections within ordinary objects, incompleteness and detachment run through his painting. 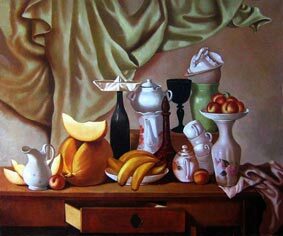 The trinkets emphasizing the character of depicted figure, the flowing folds of silk drapery, hands closing the faces, scattered sea shells and apples - all these nuances are brought to life by modest joys of everyday routine or by the recollections of a distant voyage. And as they interweave with the thin fabric of the painting, there is an impression that everything’s been done with ease, and that bribes the unsuspecting public with almost tangible charm of the theatrical acting. It’s not worth trying to elicit from the artist what the genuine allusions are in regards to a particular painting. In albums and sketchbooks spread around in the artist’s studio you would find scanty clues to unveiling the methods he uses in his creative process. Among Buryak’s earlier works of 1990’s critics singled out large and textured still-lifes and paintings of female figures, but the true attention was driven by his narrative paintings. 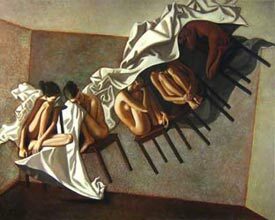 One can notice that in such artworks Andrei Buryak was influenced by surrealism, conceptualism of 1970’s and by rethinking of aesthetics of European cinema. For Andrei’s generation such a methodology has become a sort of response to the system of Soviet culture, a remedy for unified schooling that restricted personal growth. While quite young Andrei was longing to discover the world of themes, symbols and patterns; and to find his own method of artistic expression, which would be consonant with the surrounding world. It was at that time when the exceptionality of artist’s talent became apparent. The artworks of Andrei Buryak have a solid foundation. Drawing, coloring and unrestricted vision of composition – all these elements form the core of artist’s craftsmanship. Technological matters by themselves don’t distract the artist from the creative process – to construct the canvas means to be a philosopher to Andrei. The balance of shade, hues and colors is his specialty. They always are ascetic in combination and dedicated to the entire concept of the creation of internal pressure. Deliberately decorative backdrops place additional emphasis on a subject, create an atmosphere of mysterious ambiguity or even of silence. Buryak’s paintings are patterned with figures, objects and landscapes that emerge like out of dreams. Often his characters are portrayed with eyes closed. The action on canvases loses its predictability: the artist generalizes the plot, which gains laconism and significance without visible accentuating what is going on. 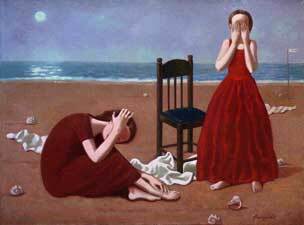 Emotional power of these works, such as “On the Seaside'', “Open Your Eyes”, “Earring” and “Shell” influences the audience little by little; the characters of the artist’s works are perceived as a consolidated representation of his life and spiritual values of the entire generation. The more reticence there is in Buryak’s art, the stronger it digs into viewer’s imagination. The special feature of his art is to awaken a sort of “culture-time” form of vibrations in the audience. Suffused with notions, the talent of the artist opens towards everyone according to their own experience, to that panorama of the associations and analogies, which is readily at a viewer’s disposal. There are plenty of “clips” taken by the artist, short dialogs as though they had been paused. The pursuit of “narrativeness” is manifested in artist’s approach to structuring a composition and landscape. There are some patterns that Buryak repeats with each painting - the objects, characters and plots - as if they are film shots. The characters of ''Sleep Phases'' (2007), ''Last Day of Summer'' (2002), unite in compositions with floating chairs turned upside down and with other trivial objects; they also reflect not just thoughts but subliminal images. At the same time such meticulousness in details (“Still Life”, “Sunset”) helps to create entirely subjective artworks, having no direct analogues, onto which the imageries of inner vision are projected. The artist forces out all compulsive ideas and anxiety that disturbs the heart to the outer world. He surmounts the obstacles that could drive the audience away from romantic sensation of hope for a joyous occurrence. Complete professionalism in the handling of colors is exposed to the art experts. The artist stretches the tones within the entire chromatic amplitude. This approach fully corresponds with a classic method of integration of an experiment into a gentle substance of everlasting human interest in history of fine arts and its heritage. 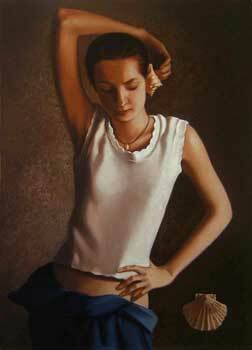 In his figurative manner of painting Andrei Buryak codes the main pictorial antagonisms with the help of symbols. Certain attempts have been made nowadays to look at various phenomena of contemporary art in the context of its connection with archaic thinking. Among the results those efforts have yielded are new, sometimes unexpected interpretations of works of art; revelation of such a content in cultural trends of the last century that is up to date and urgent to present society. This kind of view on art gives us an opportunity to take a different look at the process of its development. Just this very chance might provoke us into trying to think about Buryak’s art with its relation to a myth. The key role in Andrei’s works plays an “unnamed” character, who demonstrates to a viewer a distant but at the same time fundamental paradigm of behavior. Reverting to the processes that have been taking place in contemporary art, we can observe the artist’s references to “actions” that are connected with “current” events of recent times; adding ethical basis to an artwork; and a referring the audience to historically prevalent values. 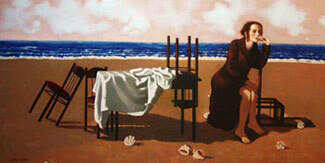 The color also obtains some semantic meaning, while removing the characters from his or her dramatic environment. 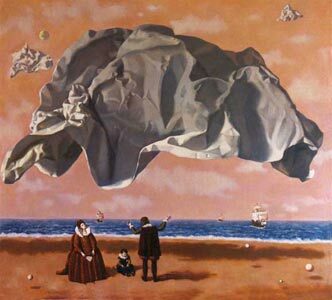 Admirers of modern art can notice some resonations with works of Rene Magritte and Giorgio de Chirico, although Andrei Buryak has extended the resembling themes. Painting a figure with a closed face is quite a widespread artistic move while at the same time it demands wide knowledge of physiognomy from the artist. Heads bowed, houses of cards, scenes on the sandy beach – these are the common symbols of futility of human illusions … and the artist comes back to them from time to time. All the characters in his paintings such as “Columbus’ Jamaica” (2002), rivet their eyes and lift up their hands while trying to catch something eluding – their dreams. And being in this motion they are ready to fly skywards. The compositions created in unrestricted and relaxed manner demonstrate a superb craftsmanship of the artist who paints skillfully and has his own inimitable vision. The art of Andrei Buryak is a present-day example of harmony of personality, traditions and creativity. Gallery of Andrei Buryak's works.